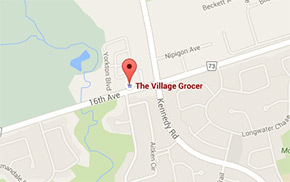 The Village Grocer is a local family store that has been in operation for over 30 years, having moved to a new and enlarged premises on 16th Avenue at Kennedy Road. When we say family, we mean it in three ways: Firstly, it’s a store where families are welcomed with open arms and accommodated at every turn, whether it’s in the program of events upstairs, the treats at the bakery or simply the kid-friendly approach to food. Secondly, family refers to our staff, who we see as family. A number have been with us since inception, and others for many of those years. Our staff is the best! Thirdly, our store is owned and run by our family. We carry only the freshest, and highest quality products available. 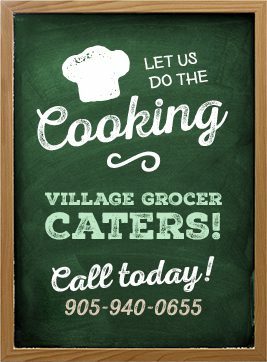 So stop by and become part of our Village Grocer family. 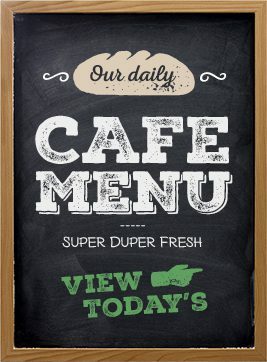 Hey guys, take a look at whats been happening at the grocer through my eyes! Fresh and exciting culinary ideas from all my talented buddies here at the Grocer. Have something for Evan to write about? We'll take care of dinner. We have pre-made meals available in store & numerous other locations, taking the hard part out of making dinner.